The winter has held off in Philly so far this year, and it’s been unusually warm and sunny so far in November and December. My mind couldn’t be happier but my belly must be pretty confused because I am already craving soup! You will soon learn two things about me after reading this blog… 1. I love soup. 2. Almost everything I eat is SPICY!!! 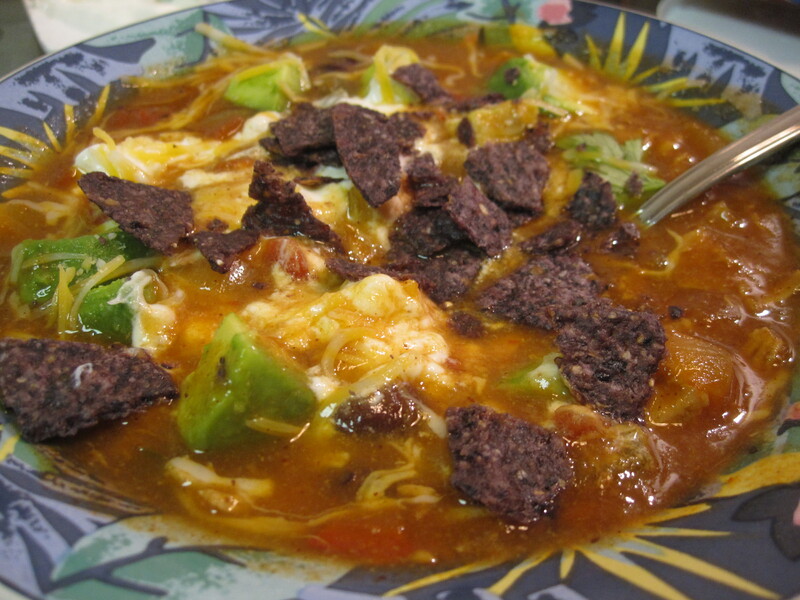 Since I’ve been interested in cooking, I’ve always wanted to try to make Tortilla Soup. It’s one of my favorite soups to order out but I knew it was complicated and have avoided trying it out on my own. I figured starting my blog was a great time to give it a go! The recipe I made was a Chicken Tortilla Soup. I had some frozen chicken breasts which I took out and defrosted when I got home from work. I like to buy chicken when it’s on sale at the market, slice them in half (they are SO thick now! Blech) and freeze them to use later on. 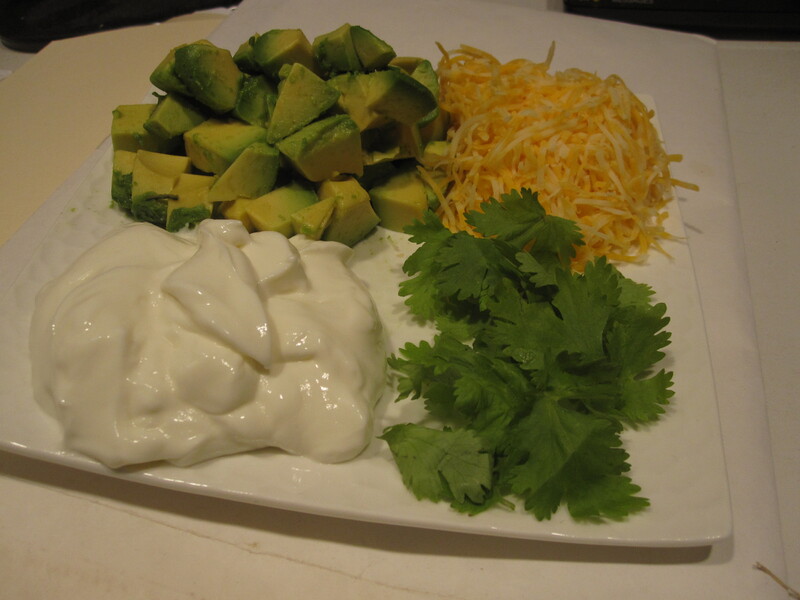 Optional Garnish: Tortilla Chips, Avocado, Onion, Salsa, Shredded Cheese, Sour Cream, Cilantro, etc. Whew! This was a big grocery list but I actually had mostly everything already at home. Anything else that I had to buy was pretty inexpensive, so I liked this recipe! First, preheat the oven to 375. 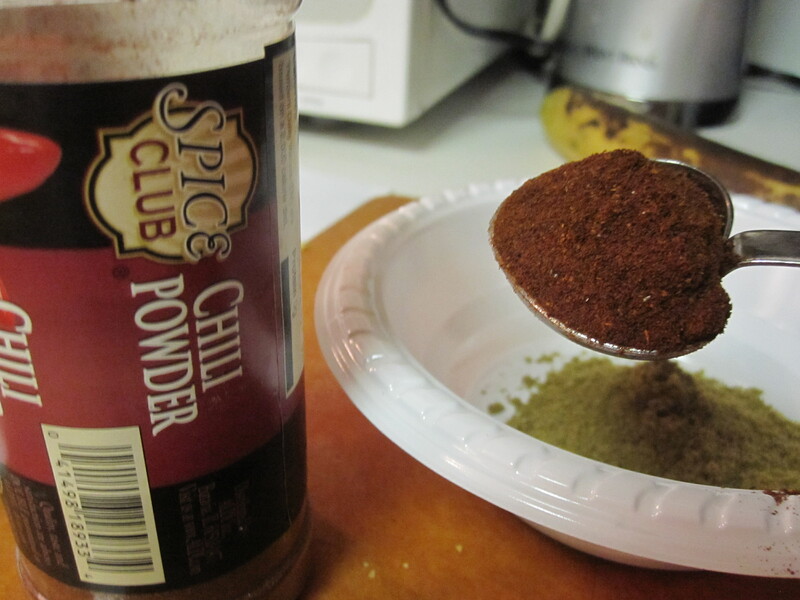 You first want to mix your spices together in a small bowl. Spray a pyrex baking dish and place the thawed chicken breasts in there. I use a oil-sprayer (that’s what I call it at least!) so if you have that, it’s your best bet but if you don’t you can just drizzle the chicken with a little bit of Olive Oil. Sprinkle about a tablespoon of your spice mix onto the chicken and put in the oven to bake for about 20-25 minutes. 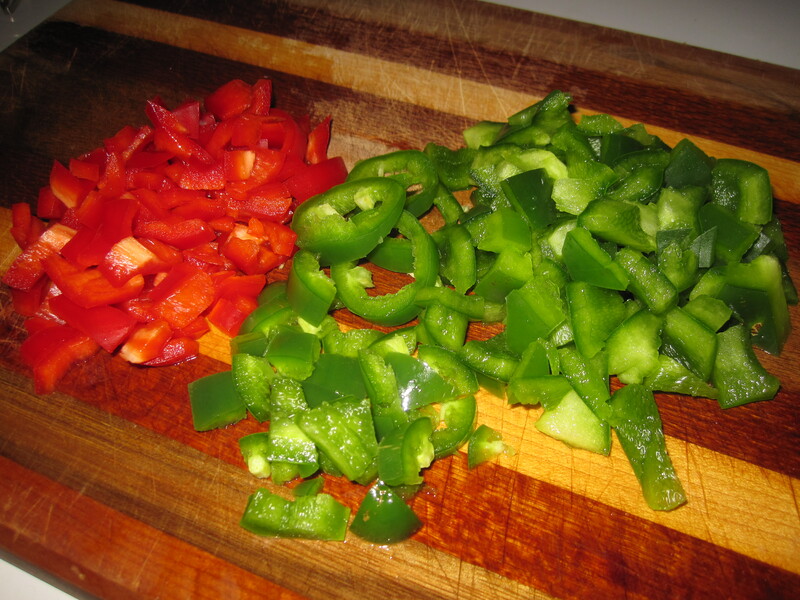 While your chicken is cooking, cut all of your peppers and start to sauté them in a pan with 1 tablespoon of olive oil, the garlic, and the onion over medium high heat. About ten minutes into sautéing the veggies, dump the rest of the spice mix in. 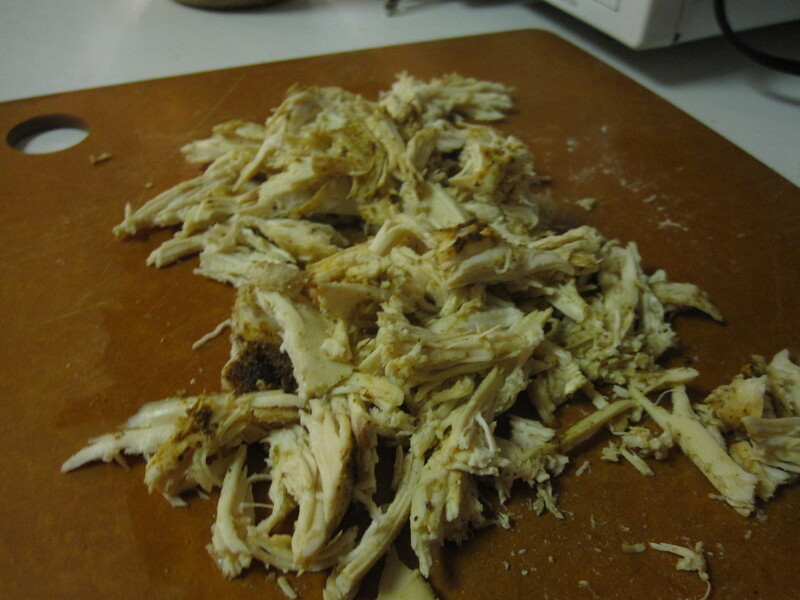 Take the chicken out of the oven and place on a cutting board. Shred the chicken with two forks and dump it into the sauté. Pour in all of the cans (Rotel, chicken stock, tomato paste, beans) and the 4 cups of water. Stir, then bring the mixture to a boil. Reduce heat and bring to a simmer for 20 minutes, uncovered. Mix the cornmeal with a few tablespoons of water, until it becomes moist and you can stir it. Pour this into the soup and stir. Simmer for another 20 minutes or so. This is a good time to taste the soup to see if you need to add any other seasonings. I put all of the garnish aside so we could top our own soups! Ladle the soup into bowls and you can either top the soups off with the garnish, or you can do what I did and place them out for each person to top themselves! I used avocado, fat free sour cream, reduced fat Mexican cheese, some fresh cilantro, and a few crunched up blue tortilla chips. The soup turned out fantastic. My favorite part about it was the avocado pieces that I mixed in, they were a cool break from the spicy soup. It was a little thicker than I was expecting but it was so flavorful and fresh. 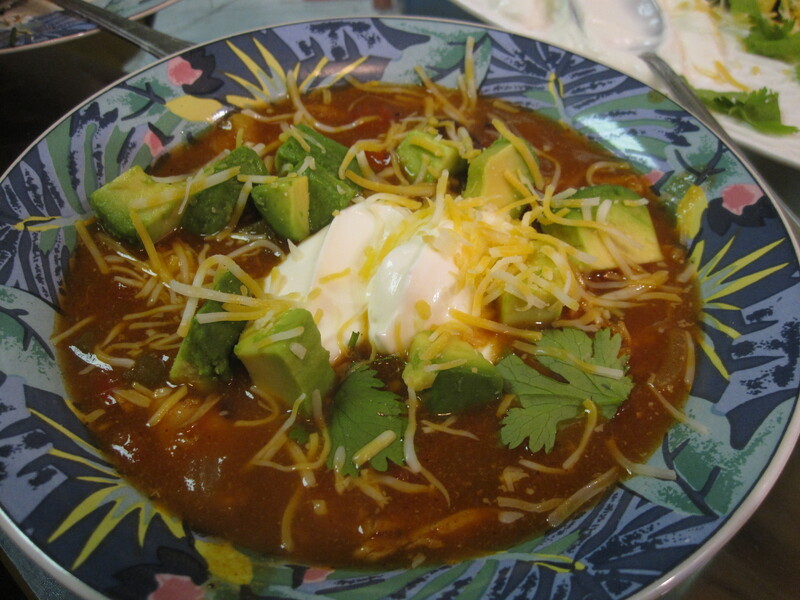 If you don’t like spicy, you can still try this soup, just omit the cayenne and jalapeño. As if this wasn’t enough… I also prepared a baked potato for Dave and myself to go along with the soup. I baked the potato in the oven along with the chicken on a piece of aluminum foil, poked with some fork holes, sprayed with my handy “oil-sprayer”, and topped off with a sprinkle of sea salt. I left the potatoes in the oven until my soup was cooking for the last 10 minutes. I think it had been in there for an hour, maybe a little longer. Once I took the potatoes out, I opened them up like Alton Brown taught me. 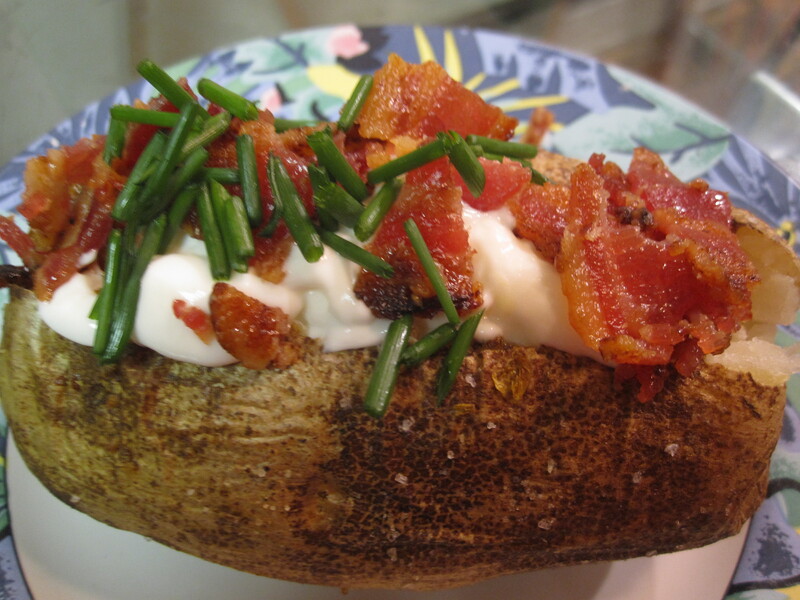 First, you poke fork holes in the middle going long-ways down the potato. Then you squeeze both ends of the potato together. Just like that and it’ll pop open without breaking in half! These big babies were garnished with the sour cream, some fresh chopped chives, and a little taste of my Dad’s special bacon leftover from his dinner. I’ll teach you how to make that some other time… it’s to die for and totally worth the calories. Your photos are excellent, Beth! very colorful and appealing. Can’t wait to try the soup!